Rick Ross Wiki, Net Worth, Weight Loss, Wife, Is He Dead or Alive? With the emergence of Rick Ross first hit single Hustlin, he became unstoppable and a vital force in the hip-hop music industry having under his belt a total of 7 mixtapes, 10 studio albums, 87 singles, 91 musical videos, 1 soundtrack album, and a compilation album. A feat that has earned him several nominations like the Grammy awards. He owns other businesses like Wingstop Restaurants and Maybach Music Group. Read on to learn more about his net worth, his journey to weight loss and if the mogul is married as well as information about his children. Born as William Leonard Roberts II on January 28, 1976, Rick Ross, as he is known on stage, is an African-American born in Coahoma County, Mississippi to Tommie Roberts Sr. His mother is unknown and he has a sister called Tawanda Roberts. 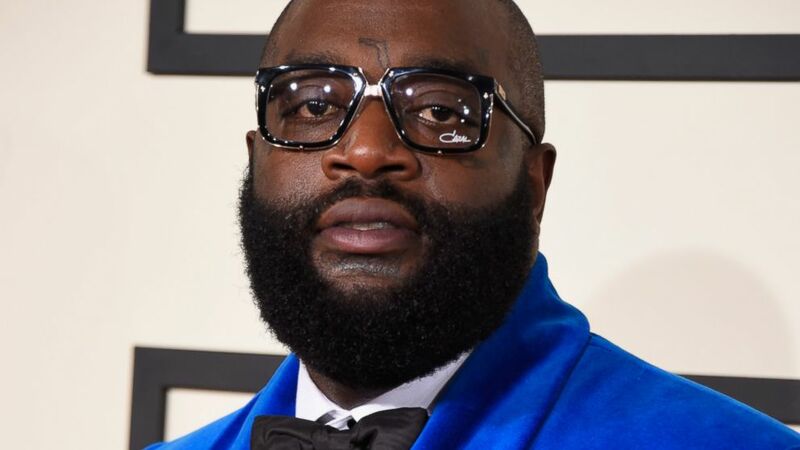 Ross grew up in the impoverished part of North Miami, Carol City where he dabbled into drugs which would later influence his rap rhythms and lyrics. He had his high school education in Carol City High School where signed up on the school’s football team. His outstanding performance as an offensive player eventually landed him a sports scholarship with the Famous Black College Albany State University where he only spent a year before he quit school in pursuit of his dream as a musician. His musical inspirations came from the experiences he had on the street in his early years and he patterned his songs like those of Notorious B.I.G and Luther Campbell. His music career took off when he joined a local street rap group The Carol City Cartel, as he built up momentum in the 1990s. His moniker Rick Ross was contested in court but he won the suit to retain the name. He had a short stint was with Suave House Records previously known as Eightball & MJG before he joined the Slip ‘N’ Slide Records that eventually handed him a shot at the spotlight as he joined Trick Daddy and Trina in their tours and featured as a guest artist in their songs before he recorded his first single Hustlin in 2006. Following the release, a scouting bid war erupted as record labels scrambled for his signature. He was the first person signed on with the Bad Boys Entertainment and he later inked his first multi-million contract with the famous Def Jam Records where he releases his debut studio album Port Of Miami that found its way into the No. 1 spot of the Billboards, sold off over 187,000 units in the first week of release, and earned a gold platinum. Rick Ross also founded his own music group the Maybach Music Group in 2009, from where he has released all his songs/albums from 2009 to date. The label has also signed artists like Meek Mill, Wale, Omarion etc. He has collaborated with other top acts like Jay Z, Ne-Yo, Mary J. Blight, NAS, and Chris Brown among others. The mogul has also featured in a handful of films and television shows like the Days of Wrath (2008) and Late Night with Jimmy Fallon (2009-2010) as well as the second season of Magic City (2013). He later ventured into food business by the spiced chicken franchise, Wingstop, thus making the brand more popular than ever. The business is flourishing and has steadily added to the increase of Rick Ross’ net worth. In other matters, the hip-hop mogul found himself feuding with 50 Cent for years in the past and has become a widely controversial figure for some of his lyrics which led to a backlash. He was dropped from his label to that effect and the TV shows he was on was canceled. Rick Ross rakes in a whopping $9 million while his net worth is estimated to be about $35 million. This comes from an accumulation of earnings from the sales of his records, his tours (which are just a few of them as he rarely tours unlike other musicians), Maybach Music Group, and his franchise of the Wingstop food chain. The record executive is not married to anyone but has been in a series of relationship which has resulted in childbirth. In fact, the giant-bodied rapper can be linked to about 18 women. He is currently getting on with a brand promoter and consultant, Lauryn McRoyal, who has worked for top U.S companies. The duo started dating sometime in October 2017. Lauryn is a graduate of the University of Illinois and a mother of 1. So far, he has four adorable children from three women; a daughter Toei Roberts, who he had with Lastonia Leviston on 23rd March 2002, a son William Roberts III with Tia Kemp in 2005, and then Berkeley Hermes (5th September 2017) and Billion Leonard (6th November 2018) who he had with Briana Camille. Some of the ladies he has been romantically linked with include India Westbrooks, Paige Imani, Keyshia Dior, Khloé Kardashian, and Liz Hagelthorn. He was engaged to about 3 different ladies previously one of whom was Lira Galore in September 2015 after he was released from prison for assault charges. Sadly, they parted ways after a picture of her dancing and hugging Meek Mill circulated the internet. After a series of life-threatening health challenges, the rapper was prompted into a weight loss regimen and he wholeheartedly embraced healthy diets, foods, and exercises which gradually led to him shedding off up to 100 pounds (45.4 kilograms) of weight and moved from weighing 350 pounds (159 kilograms) to his current 250 pounds weight (113.4 kilograms) – a feat that has helped project his 6-foot height. On the early hours of 6th November 2018, Rick Ross again for the second time became the center of an internet hoax. The first ever time he was presumed dead was in March 2018 following a heart-related emergency he was diagnosed with after he was discovered to be unresponsive in his home. And while others concluded he was dead at the time, fellow musicians like P Diddy and Missy Elliot steadfastly prayed for his full recovery. It is noteworthy that in October 2011, he also experienced two heart seizures which were later attributed to work-related stress and lack of sleep.